I woke up suddenly at midnight, since I had a sign in the right palm then. I've descended to the earth as the subconscious mind. 'Bethlehem' means （in Japanese） "something makes the different world." Making the different world means the Ruler's Stars manipulate the humans and make the different world. I was told round things （=Stone gods）are villains over and over. Round things are the buildings which represent circle（=mosque）. Fight between Islam and Christianity had begun by this. （Those Islamic people who gather together in the mosque）wear the headwear and tighten （by cloth）the hair which represent God. That's why I told Islamic people are villains." "I have something to tell anyway. Those who turned into stones had been working before the another world started. It means those who turned into stone statues had been working. As those people noticed they would turn into stones, they remained the shapes which they wanted to be. However Jesus was semi-Stone man, he could move without becoming stuck. He went to Jerusalem according to the instructions of the voice. He had been in Italy （Florence? Rome?）. Mediterranean sea in those days was not the sea but the broad plain. Therefore he rode the horse to Jerusalem. Gaza has become the place of conflict forever, because there is evidence that Jesus had been there? It is in the round thing（mosque?) . It located in the outskirts of Gaza. They were not so large Stone gods. Two whitish rock buildings are lined happily side-by-side. I tear out though I did not feel sad. "The reason why I tear is that I was unleashed at last. There was a time when the stone spoke. I continued to be told not to say about it by the Ruler's Stars though. I could see what other people could not see. Therefore I taught it to those who did not know the unseen world. When stones issued instructions, water changed into wine. Those who turned into the stones made us food. It was eaten by the people who turned into humans. Mediterranean was the broad plain, where people of stone statues and bronze statues who came out of the sea lived there. Those who turned into the statues remained intact so that they could tell that they had lived prior to the time of humans. They divided into bronze and stone people. The person chose what type of statues they would become by choosing the component of their bodies. We had to wait for thousands of years prior to the time when you can find out that we had been alive ." 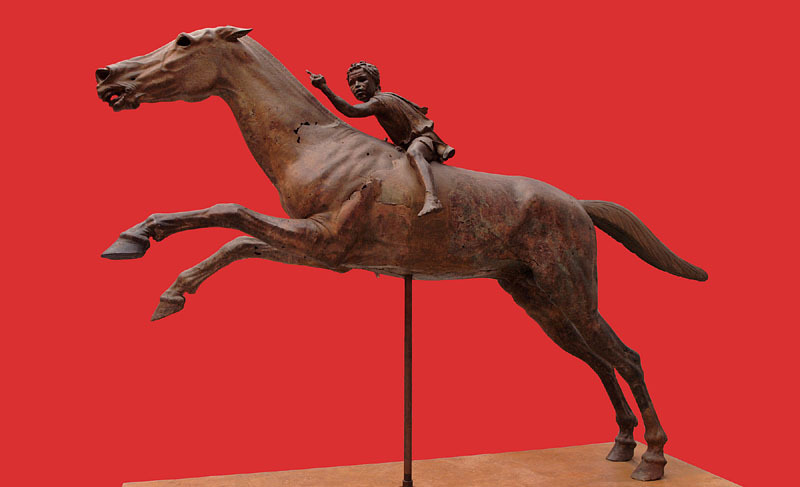 I asked again （through channeling）whether the story about the boy on the horse （in Archaeological Museum of Athens) is Jesus is true or not. "Jesus was born as a child of Maria in the cave of Bethlehem. When he was a boy, he went to Florence on a horse, as he was called by Stone god. The atoms of Stone god were left as a statue（in Archaeological Museum of Athens) to convey it. When Jesus grew up, Stone men got stuck. Therefore he was called by Stone gods again, and he tried to go back to Bethlehem. He went back on a horse as well as he went to Florence. When he arrived in Gaza, he was called by Stone gods in Gaza. There were two lined Stone gods who had become white round buildings. The reason why the fight is going on in Gaza now is they want you to tell about it." I（Ms Taeko Shiraki）asked Jesus whether it was all that he wanted to tell. "I have more to tell. The earthquakes which happened in Greece were the ones which Stone gods caused in desperation. Do humans really think those who lived in the stone age could make the statues which looks as if they were alive? Do you really think those who had no tools could make megalithic architecture which are hard to make even in modern technology? The above are the questions to the leaders（scholars）who insist those megalithic architecture were made by humans. From the beings in the universe"
I found the statue in the place where it was a little dim in the museum. I remember that I thought both the horse and the boy were really alive. There was also a statue whose eyes are made elaborately as if they were the modern artificial eyes, though I forgot where I saw it. ＊）Stone gods in Greece inform by causing the earthquakes.